BIG HIT, one of the EU’s largest ongoing hydrogen demonstration projects, focuses on the development and implementation of a fully integrated model of hydrogen production, storage, transportation and local use for low carbon heat, power and transport in the Orkney archipelago which is located 16 km (10 miles) off the North coast of Scotland and contains over 70 islands 20 of them inhabited. The project is built upon the Orkney Surf ‘n’ Turf initiative which involves generating hydrogen from excess electricity supplied from tidal turbines and onshore wind turbines. 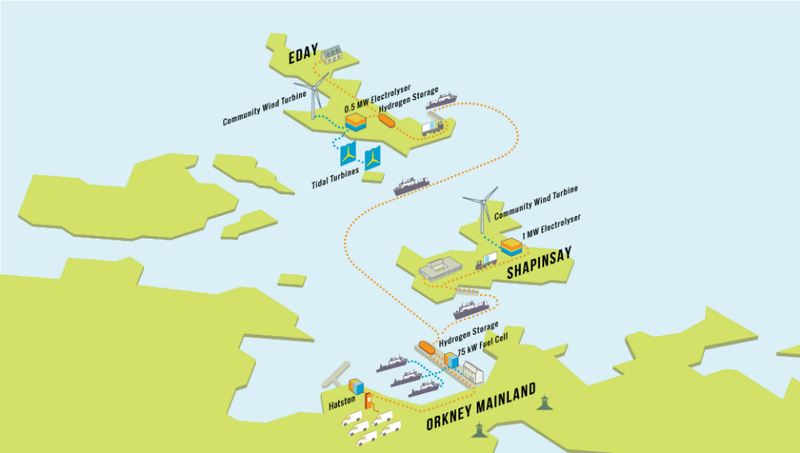 The Shapinsay and Eday islands of the archipelago hold community-owned wind turbines whose excess energy will be used to produce hydrogen for the BIG HIT project. The currently curtailed wind and tidal capacity from the Shapinsay & Eday islands are used to split the component elements of water (by the process of electrolysis) to produce low carbon hydrogen and oxygen using two large PEM electrolysers. Systeng Consulting is the technical coordinator and responsible for all project deployment, operation and project management activities. BIG HIT is a leading €14 million European demonstration project, co-founded from the European Horizon 2020 programme (European Commission), the Scottish & UK Governments.